The old farecompare.com site used to have a list of lowest fares available from various airports, along with filters and such to help suss out potential deals/mileage runs. It went away and getting a good collection of that data has been somewhat difficult for a while. It just got a bit easier! Now available is the Fare Finder from Wandering Aramean Travel Tools. It covers about 100 airports in North America and another 50 in Europe as origins for the queries. There are a bunch more destinations available in the results, too, with more being added as the system scales up. Right now there are over 360,000 fares in the database. It also has a built-in CPM calculator (based on direct distances, so you can probably do better) but does NOT include the YQ or other taxes, so take that in to consideration when looking at the fares. The default filters allow for limiting to an individual airport or by destination region. Registered users have the ability to filter the search results by carrier. And users who have upgraded to the First Class level can also filter by price range or on a radius from the origin airport. First Class users can also store their preferences for carriers to be excluded from the low fare search results. The fare data currently updates daily, though more frequent updates is part of the product road map. Oh, and while you’re on that page, check out the options for finding *-UP fares from UA, US, DL and AA as well as SWUable fares from Delta or GPUable fares from United. Is there a way to find out what the day of this cheap fare is so it can be searched somewhere it is bookable? I’m seeing BWI – BCN for $138 on your search tool, which is amazing. How can I translate this to actually finding a ticket? I’m working on a search interface (or at least a useful link) but right now you’re mostly on your own to find it. ITA is probably your best bet with the flex search option. As for the BWI-BCN fare, keep in mind that it excludes the YQ and other taxes. That will actually probably come out to something around $750 after the fees are included. Thanks Seth, you’re on a roll lately with useful tools. I may be missing something but I’m not sure the destination filters are working right. For example, I put in BWI in the box up top and selected Destination Region as North America… but I am seeing tons of fares from Europe TO BWI – when what I’d really like to see is just fares between BWI and other North American points. The city filter showing on both the to and from column is a bug I’m working on right now. Basically the issue is that fares within North America are symmetrical so I only query half of them to save on resources. But it does make the data results look like that. I’m working on a fix that I hope to have up soon. The issue with the city filter and showing origin as destination should be resolved, at least for now. I’m looking closely at the data to make sure I’m not accidentally hiding useful results from being displayed, but I think it is working properly now. I figured it was something like that. Get that working and I will be using this regularly – and, as I tried to argue to FareCompare, gladly pay for it! Also, unlike farecompare, it appears to actually work, although there seem to be some discrepancies compared to eg expertflyer. The results are much more accurate than I ever got from farecompare for skyteam out of MSP. Matt: I’m curious what discrepancies you’re seeing. Is the fare current (query date is the right-most column)? Or am I missing one that is possibly lower? I am somewhat at the mercy of my ability to generate the data and the source I’m pulling from so I don’t expect it to be perfect, but I want to get it as close as I can. The specific fare was DL MSP-NAS. Query date seems to show up for some results but not others – currently it is not showing so I can’t tell you the date. Different lowest fare, and different value in this case. I imagine it’s just delta playing with pricing. Are you always returning round-trip price? Would be very nice to look at 1-ways as well sometimes, or at least get an indication of whether the fare requires a round trip. That fare was from yesterday so it is possible it has changed. I am only doing r/t pricing right now. One-way would be nice but, as of today, that’s just too much data for me to handle. Maybe in the future. no problem, and most of the time easy enough to know anyway. You’re *way* ahead of where farecompare was in terms of returning large amounts of useful fares. It does look like that fare has been bouncing around a bit. Thanks Seth I hope your generosity providing these tools gives you no end of good karma and great travels. The tool says the cheapest fares from my airport (RDU)are to Barcelona and Madrid. How is this information helpful in making travel decisions if the taxes and fees (which are substantial) are omitted? It’s like advertising a car for the price of the tires (engine, doors, seats, frame, and gas not included)….sorry, I just don’t see how this tool is useful without full pricing…. It is useful in a number of circumstance, George, though certainly not in all cases.For the wholly domestic flights there is no YQ so it is useful there. For folks who like to find FDs the base fare is often just as important as the all-in fare so it is useful there. If you want to compare fares to nearby destinations it can help with that, too, which can be useful. I certainly don’t expect it to be all things to all people, but there is definitely some value in it for certain types of searches. Great tool, Seth! Anyway you can add LIT to the list of airports? Very nice! Thank you for the time and effort this must have taken. Any chance of adding TYS or CHA? I’m glad to see AVL, though TYS (and perhaps CHA) definitely have more operations. Thanks again! TYS and CHA are in the system now; you should start to see data from those destinations showing up already and filling out in the next day or so. Fantastic tool. Perhaps a little screen cleanup required, but the speed and quantity of available fares is amazing. (Z C D J fares) Only a few are listed. 4. 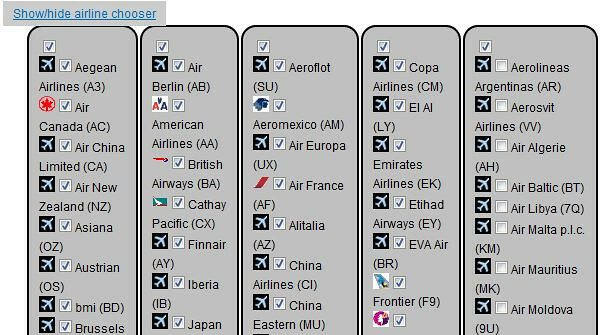 Alliance groupings as an option when selecting airline. Also tried to sign up for the annual First Class options, but no screen appeared for payment. Perhaps an OSX issue? If so I will log into a PC. Also – how often is the fare data updated? Fare data is updated daily, more or less. I’m hopeful that the cycle can be increased but that’s a long-term plan right now. The First Class upgrade issue was a problem with the new design template released this week. I’ve fixed it and it should be working now. Still not able to use the First Class upgrade. Tried using both Firefox and Safari on OSX. Thanks for adding TYS and CHA! That’s terrific! One slight oddity, though. It seems that only TYS-Canada fares are loading when North America is selected. 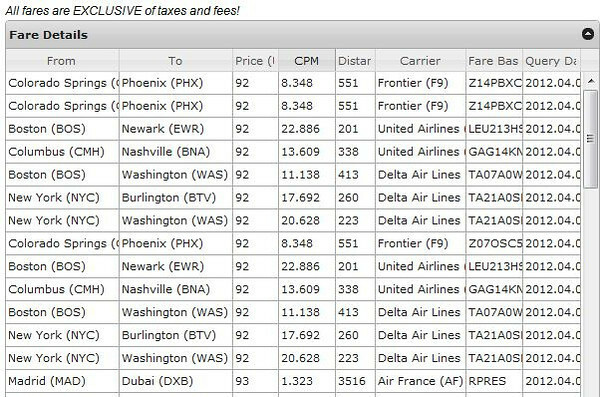 I don’t see any TYS-United States fares, though I may be doing something wrong. I think I’ve got the TYS issue (and it was affecting other airports, too, but this was the first solid report I’ve had of issues) figured out. You should start to see all the destinations showing now. Short version of the story is that the fares are symmetrical in North America so I was only querying half to make things more efficient. I was also only displaying the half I was querying rather than showing all of them. Whoopsie. Yup, it’s working now. Thanks so much!!! Neat tool. How come it wont search for “R” fares on United. I tried an Intl and a Dom where the UA website showed R availability. The Single-Bucket Inventory gave no reply. I’d gladly become a first-class member for that feature. I don’t currently have UA R inventory available to search right now because it isn’t one of the buckets in the GDS I’m pulling from. There are ways to get it and I’m working on adding it eventually, but it isn’t there yet. The data was always from a 3rd party. I lost access to the data and I haven’t been able to replace it yet. Send me an email with your username on the site and I’ll refund your payment. I wish I had the data. I really do. but no way I’m going to keep your money if I cannot provide the service.